We assembled an A-team of mom bloggers to share their top organizing tips and tricks. 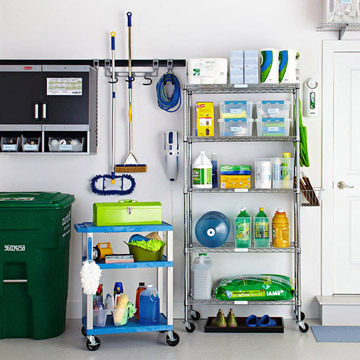 Try one tip a day and you'll be on your way to a much cleaner house for the new year. 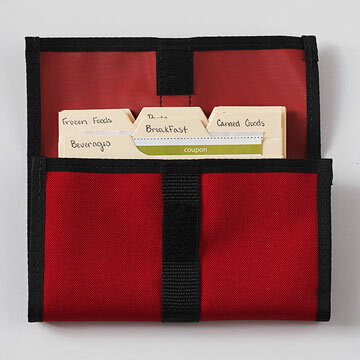 Holly Bohn-Weiss of SeeJaneWork.com recommends using colorful binder clips to secure the family calendar to the front of a wall pocket. After jotting down events, she drops backup info—invitations, directions, the list of items needed for an upcoming school field trip—in the pocket. This way it's a snap to stay on top of appointments and activities. She recommends Magnetic Wall Pocket, containerstore.com, $20. Get rid of clutter in the laundry room by installing a wire cable curtain rod for hanging wet winter parkas and other gear (or anything else you want to air-dry), says Erin Rooney Doland of Unclutterer.com. Doland recommends Dignitet Stainless Steel Curtain Wire, ikea.com, $13. Make it a no-brainer for children to drop their clothes in the laundry basket, says Doland. 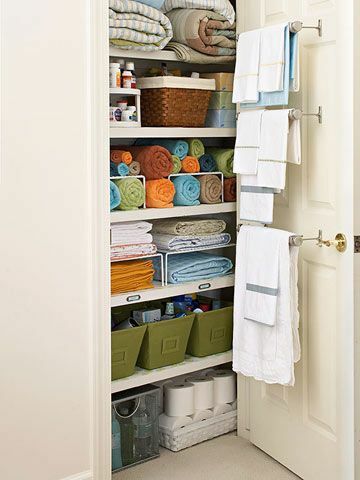 Set out multiple hampers in user-friendly locations like the bathroom, inside a closet and beside a bureau. 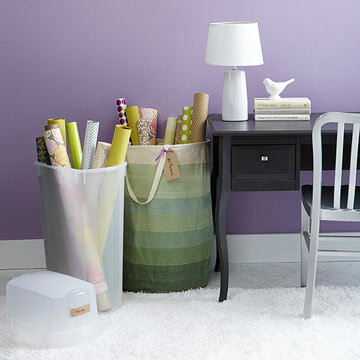 Instead of folding sheets, roll them into bundles and stow, along with pillowcases, in labeled canvas bins. 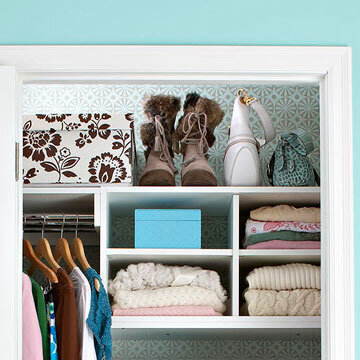 "It's easier and you streamline your closet at the same time," says Carmel Phillips of OurFifthHouse.com. Sarah Saucedo of ThriftyDecorChick.blogspot.com neatened up the mess on the highest shelf in her coat closet by stashing small, seasonal items—such as hats, gloves and beach gear—in the cubbyholes of a standing shoe organizer. 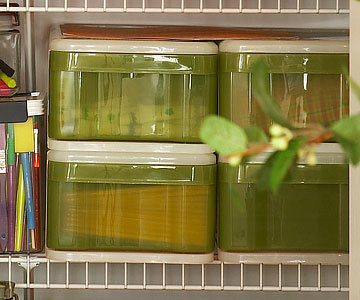 To reduce paper piles, set stacking letter trays on a shelf and a recycling bin on the floor in the hall closet. Use them to sort and stash mail as you go through it, advises Bohn-Weiss. A clear plastic shoe box is just the right size to contain single-serve foods like yogurt, applesauce and pudding on a shelf in the fridge, explains Cassie Freeman of HiSugarplum.blogspot.com. Dusty Rogers of AllThingsGD.com customized an unfinished Ikea six-drawer chest with paint and modern stainless pulls. 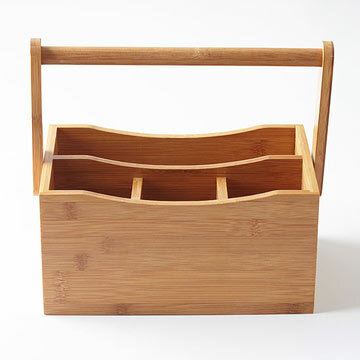 Placed near the kitchen table, the bureau creates extra storage for Rogers' laptop and office supplies as well as her daughter's art materials. Free up space in the kitchen by installing peel-and-stick steel sheets on the backs of cupboard doors, says Dina Holland of HoneyAndFitz.com. Adhere magnetic tins and containers to hold spices or small junk drawer items like rubber bands, safety pins, notepads, pens and scissors. Holland recommends Steel Sheets, magnapods.com, $7. 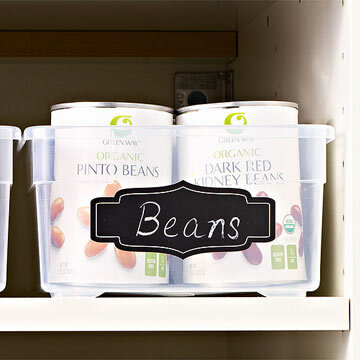 End needless hunting for pantry staples by grouping like foods—soup, beans, crackers— in transparent bins, says Courtney Fernan of AThoughtfulPlaceBlog.com. Chalkboard labels make it a cinch to switch up the categories. 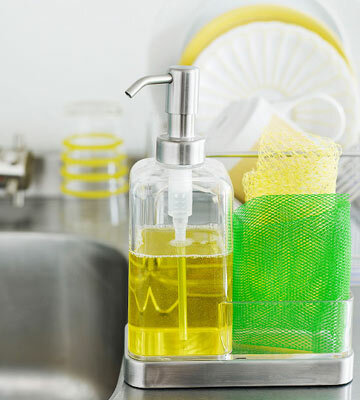 Create extra space under the kitchen sink by hanging spray bottles from a tension rod mounted inside the cabinet, says Freeman. Sponges, scrubbers and drain stoppers can go in a wire basket installed on the door with inexpensive Command hooks. Freeman recommends Room Essentials Tension Rod, target.com, $4. Michelle Hinckley of 4men1lady.com keeps a large clear plastic file box for each of her children, with folders labeled by school grade filled with important pictures, report cards, documents, journaling pages and more. "It becomes a box of memories for them." 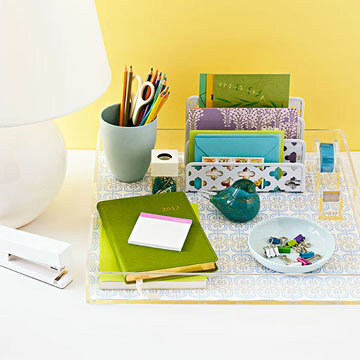 Trays are a secret weapon for bringing order to any surface, says Cristin Bisbee Priest of SimplifiedBee.com. "I like all types," she says. Bright lacquer pops in a room, while clear acrylic or Lucite lets you see what you're storing. Give a tray extra personality by lining it with patterned wallpaper. Day 14: Mount decorative U-shaped curtain tiebacks, which are sturdier and deeper than most hooks, inside the closet or on a wall in the mudroom, says Saucedo. "They work great for thick winter scarves, heavy handbags, shopping totes or each family member's backpack, jacket and so on." 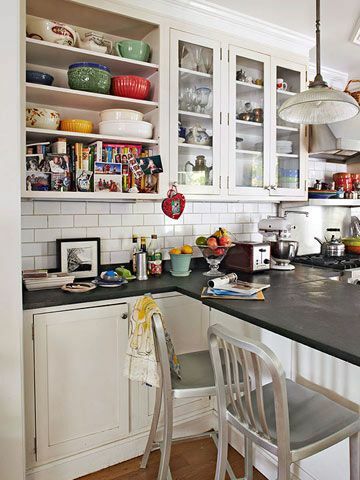 Day 15: Allocate a basket just inside the front door for stockpiling anything you don't want to forget the next time you go out—like shopping totes, library books and items to return to the store, says Melissa Michaels of TheInspiredRoom.net. 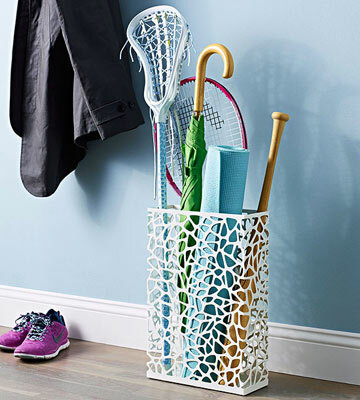 A metal umbrella stand in the mudroom, garage or coat closet can also stow lacrosse sticks, baseball bats and even your yoga mat, says Unclutterer's Erin Rooney Doland. 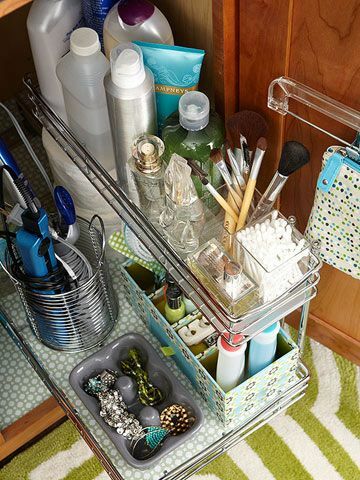 Move nail polish and supplies into the compartments of an upright silverware caddy. This way, you don't have to dig through a bottomless makeup bag to find what you want, says Bisbee Priest. She recommends Five-Section Acrylic Tote, containerstore.com, $2. 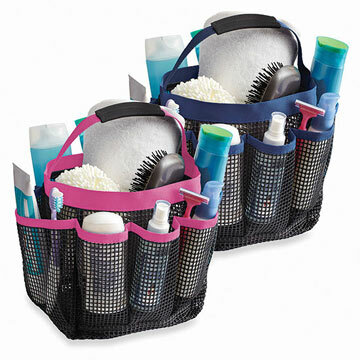 Fernan tamed the toiletries in her family's bathrooms by cutting a shoe pocket organizer into thirds and screwing each section to the inside of vanity doors. "All three decluttered for under $20!" To reduce nightstand chaos, Megan Ardoin of HoneyWereHome.blogspot.com stows books and magazines in an easy-to-reach basket on the floor. Day 20: Now is the ideal time to address that space-guzzling pile of holiday wrapping supplies. Doland suggests corralling long rolls in a portable storage cart. Over-the-door baskets on the side hold tape, scissors and ribbons. 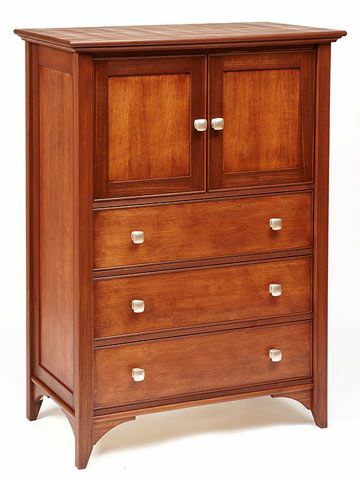 Doland recommends Tube Rack, discountart.com, $57. Day 21: Stefanie Schiada of BrooklynLimestone.com replaced traditional holiday wrappings with one giant roll of Kraft paper. A variety of ribbon and twine changes the look for any occasion. "You'll save money and free up space," she says. Day 22: Weed through holiday decor and give away what you no longer want. 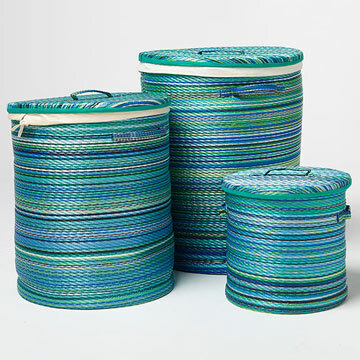 Wind lights and garlands around paper towel or wrapping paper tubes to prevent tangling and pack everything into space-saving stackable plastic storage bins, says Freeman. Megan Ardoin of HoneyWereHome.blogspot.com doesn't go shopping without a mini accordion file of store coupons sorted by her favorite retailers. 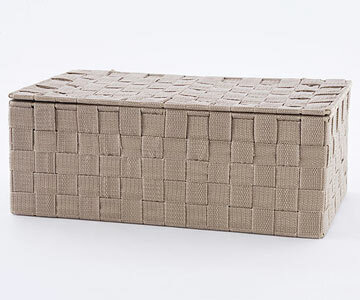 Ardoin recommends Martha Stewart Home Office with Avery Poly Accordion File, staples.com, $7. 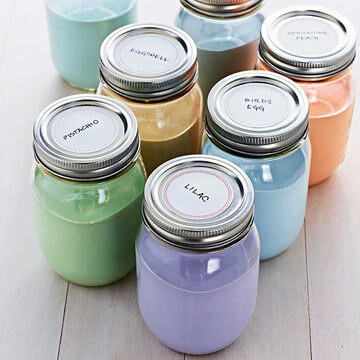 Almost-empty gallon containers of paint take up valuable real estate on garage shelves, explains Freeman, so pour the surplus into labeled Mason jars. Arrange spray-paint cans in the pockets of a hanging shoe organizer. "This system makes it easy to see what colors you have for touch-ups." 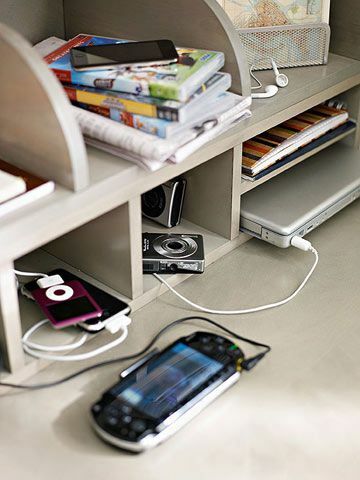 Prevent "my house is a mess" stress when unexpected guests drop by. 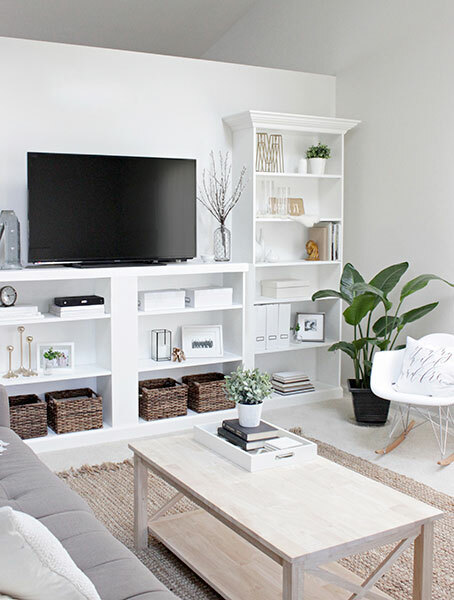 Set aside a bin or basket in clutter-prone rooms so you can corral stray stuff at a moment's notice, says Emily A. Clark of EmilyAClark.com. 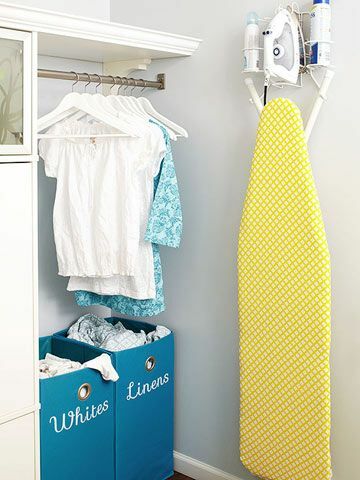 Designate a few bins in the garage for no-longer-wanted clothing, says Melissa Michaels of TheInspiredRoom.net. When the containers are full, donate. 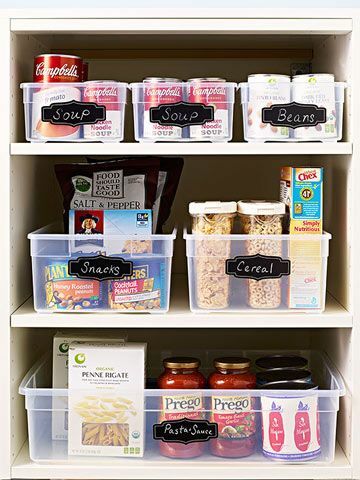 Also keep a labeled box in each child's closet for clothing he or she isn't wearing but still needs, like larger-size hand-me-downs or out-of-season sports gear. When it's time to make a switch, you'll know exactly where to find everything. 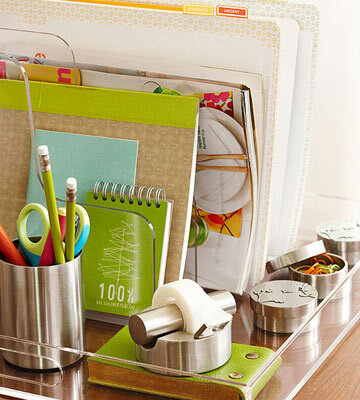 Snap binder clips on the edge of your desk and thread phone, printer and other important cord cables through the metal openings to hold them neatly in place, offers Bohn-Weiss. Put old china to good use. 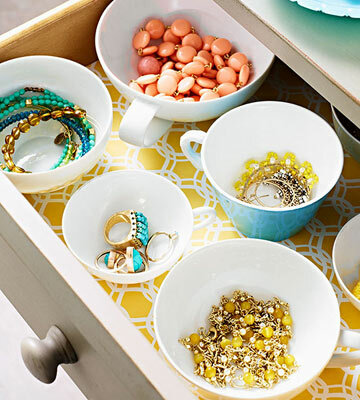 Kristin Jackson of HuntedInterior.com keeps jewelry tangle-free in a variety of small bowls lined up in a drawer. In Schiada's junk drawer, tacks, screws and safety pins look neat arrayed in white teacups. Store (and display) your kids' collections of marbles, shells and tiny figures in the slots of a vintage wood printer's tray (see websites such as Etsy and eBay), says Hinckley. The trays, designed to hold letterpress-printing type, can be hung on the wall or placed on a table. 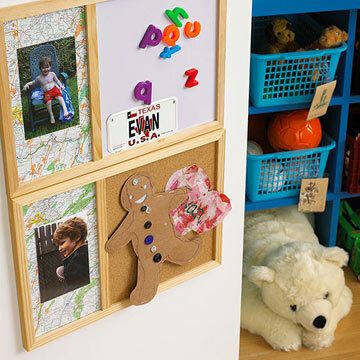 Design a temporary gallery of your kids' drawings by grouping a few on a wall and securing with multicolor removable tape. It's a great way to deal with artwork clutter, says Rogers. Rogers recommends Scotch Expressions Magic Tape, staples.com, $3. 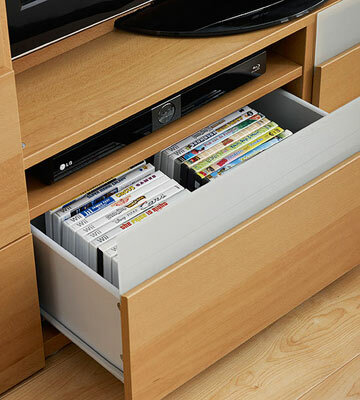 Donate that pile of movies your family doesn't watch anymore. As for the remaining favorites, toss the plastic cases and slip the discs into DVD and CD sleeves. 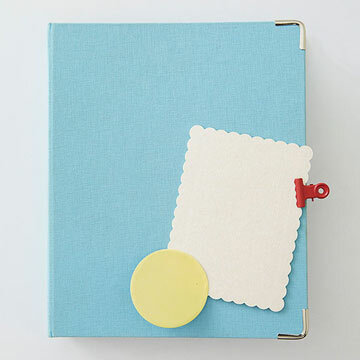 "File them alphabetically in a cute bin that you can tuck away on a side shelf," says Freeman. Freeman recommends 120-Disc Acrylic Storage Box, containerstore.com, $25.